Athens Area Habitat for Humanity is a non-profit serving Clarke, Oconee, and Oglethorpe Counties in Georgia with the mission to make decent, affordable housing available to all. As one of America’s most trusted organizations, Habitat for Humanity achieves this mission in cooperation with partners who volunteer their time, energy, and expertise to better their own communities. 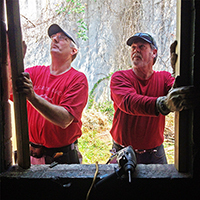 Volunteering with Athens Area Habitat is easy and no experience is required! If you are interested in volunteering, you can fill out the application found below and send it in to our Outreach Director, Hannah Mitchell. Come stop by our office at 532 Barber Street to speak with Hannah, 9am-5pm Wednesday-Friday, or call 706-715-6727 ext. 202, or email hannah@athenshabitat.com to find out more or schedule an appointment. We want to get to know you so we can work together to find the best place for you to help out with Habitat. But before you call or email, please read through the information below to get an idea of what the best volunteer opportunity may be for you or your group. Here’s how you can make a difference…. Our two ReStores are a unique part of Habitat in Athens, and volunteering here is a really great way to get on board with our mission. We are always in need of friendly, consistent volunteers to work in our stores. If you want a regular volunteer opportunity, the ReStores are the place to be. And we welcome groups of friends who want to work together! Identifying, organizing, researching and setting up donations for auctions, displays, and special pricings. We have two ReStore locations — one north of Downtown at 532 Barber Street, and another on the west side at 4125 Atlanta Highway across from the mall. Both are open Monday through Saturday from 9 AM to 5 PM. We ask that folks volunteer for at least two hours at a stretch. We accept individual volunteers and groups of up to 5 at the ReStores. Applications are accepted at our main office on Barber Street, and some orientation may take place there as well, but all initial training is done at our Atlanta Highway location. For further information on what to expect when volunteering at the Athens Habitat ReStores, view or download this quick info sheet. We love our construction volunteers! 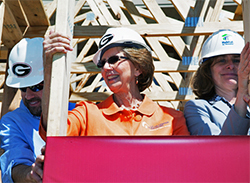 Building homes is what Habitat is all about, and we are so thankful for everyone in Athens who is ready to help. Volunteering at a construction site involves general construction and renovation work directly as well as assistance with materials, tools, etc. We even need volunteers to help with catering, snacks, and coffee. Lunch is provided on Saturday builds! Please note: Volunteering at Habitat builds is a very popular teambuilding and group activity, so we are typically booked several months in advance, especially for fall Saturdays. To ensure that you get a spot, we ask that you contact us 6 months before your intended volunteer day. 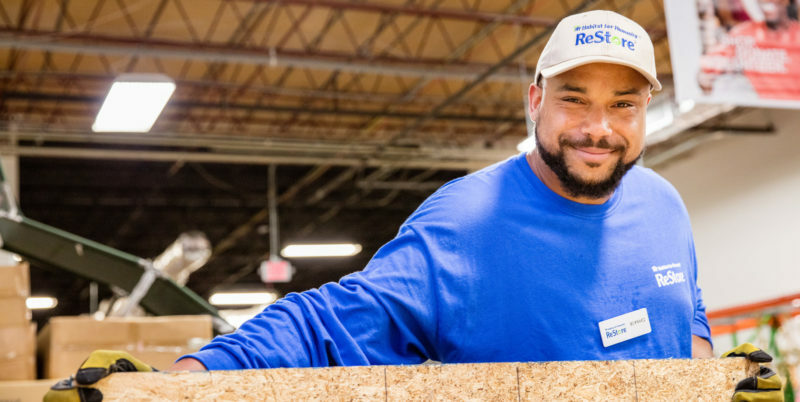 If you or your group are looking to volunteer sooner, consider volunteering at the ReStores — all proceeds from our thrift store sales go toward our mission of providing decent, low-cost housing for our neighbors in need, so you can do just as much to help out by spending a day in our stores as you can on the build site! Groups of up to 20 may volunteer on our build and renovation sites. You’ll need to be on site by 8:00 AM when the crew presents the safety briefing and gives job assignments for the day. Lunch break is at noon, and the crew begins breaking down the job site at 3:30. Individuals wishing to volunteer on build sites should have some construction skills. Wednesdays and Thursdays are best for individual volunteers. 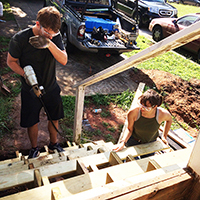 Less skilled individual volunteers may find construction opportunities on our handicap ramp projects, which mostly involve hammering, nailing, sawing, and pouring concrete. Skilled individuals who aren’t available on build days can also be of great help in our ReStores, making minor repairs to furniture, electronics, and other items for sale to raise funds for housing.